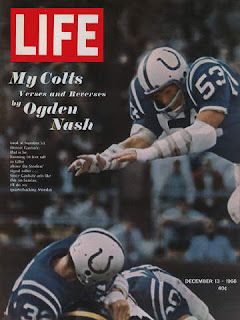 Recognizing Nash's passion for his hometown NFL team, Life Magazine offered Nash the opportunity to showcase his poetry in 'My Colts - Verses and Reverses', their December 13, 1968 cover story. You wonder if he's man or myth. 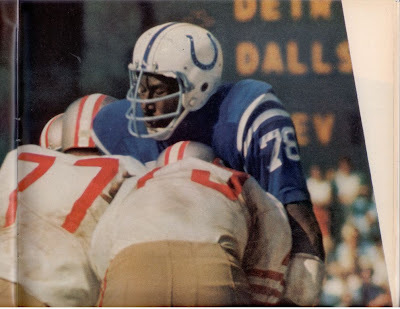 Three hundred pounds of hustle and muscle. It isn't Bubba who gets creamed. What gained this pair of underminers? 'Verses and Reverses' was as much a tribute to the nation's adoration for Nash as it was to the Colts. How many contemporary poets have ever been featured on the cover of a popular national magazine? And tobacco in my jaw! To hit 'em where they ain't. 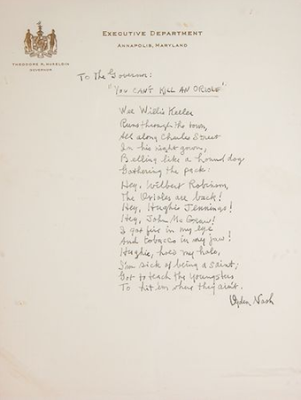 Copyright © by Linell Nash Smith and Isabel Nash Eberstadt.